**Products Provided** Hi Everyone! For today's post I have some cute little decals for a review from Born Pretty Store. They have tons of affordable nail art supplies from brushes, polishes and nail art decorations! Especially now that Black Friday is coming up, these are great for purchase. I chose these adorable kitten decals that looked as if they were on cloud 9! Well that's how I envisioned them. These specific transfers come in one sheet per packet, which you can find here. Each of the cat stickers come in variety of styles to choose from. 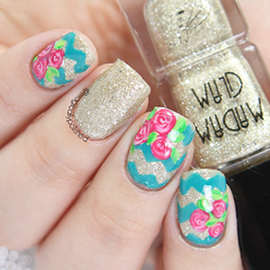 They are super easy to apply, similar to the floral water decals I did. I've even done a tutorial which you can find here. Only difference is I didn't have to apply color. First I started by applying two coats of Color Club Take Me to Your Chateau, for the base. Once the the polish dries, using a dotting tool I added a variety of clouds, with OPI Alpine Snow. Which by the way without the decals looked pretty cute. Now for the decals, which is pretty simply and easy to apply. Like I've said before I made a tutorial on how to apply them to the nail here. Even when you do purchased them, the instructions are behind the packets. Once I've chosen the designs I wanted, I carefully applied the decals on the nails. Lastly, I then sealed the design with Duri- Super Fast Dry Through Top Coat, that's it! Kitty is now on Cloud 9. Some of the decals were larger than I thought. Since I have small nails I used the smaller kitty's for my regular finger and the larger cat for my thumb. So I how can you pass on these! Even for .99 cents each. These are adorable and easy to use!